I love the fabric and weight of these. They flow beautifully and the color is perfect for my room. The blackout works very well. I used them in the front of the house to block out light and people peering in. We took our best-selling Faux Silk Taffetas, added beautiful colors, sumptuous patterns and our best light blocking lining to bring you our new collection of Printed Faux Silk Taffeta Blackout Curtains. This collection is going to change everything you thought you knew about light control curtains. With beautiful patterns, printed in colors from soft greens and golds to deep blues and greys, this collection has something for everyone, with the added benefit of helping you block cold, heat and light. 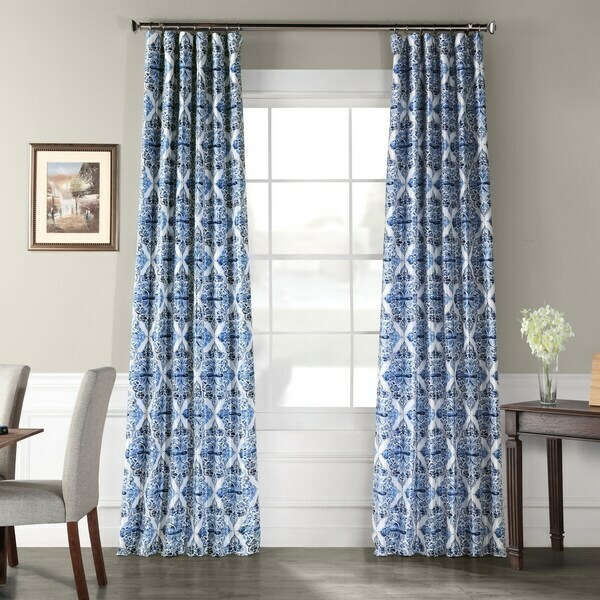 Love love love these gorgeous heavy weight curtains! They hang beautifully and add a lot of color to the room! So easy to take care of too as they are a slick curtain so dust does not cling to them.